To look around, touch and drag anywhere on the right half of the screen. To move, touch and drag anywhere on the left half of the screen. If you're left-handed, you can swap the joystick and the look touchpad in the options panel. Objects (items, doors, characters, etc) you can interact with will unfold buttons when you get close enough to them. To equip or use an item, you must map it to one of the HUD buttons along the top of the screen. First, press and hold any of the HUD buttons until the HUD opens. 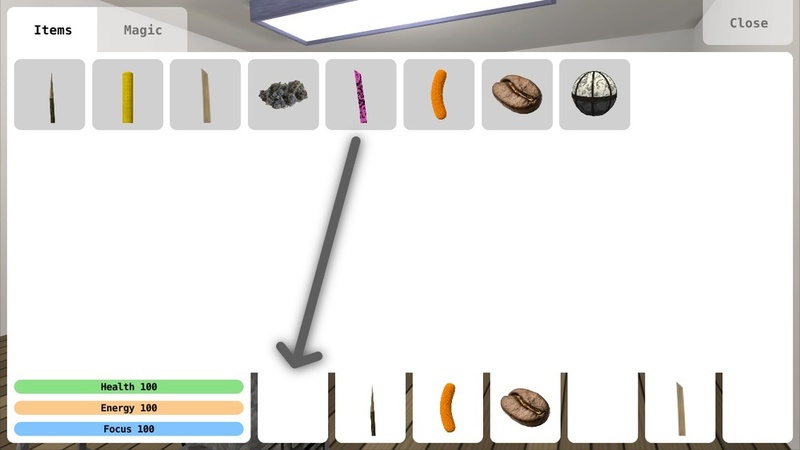 You'll see all the items you can equip or use represented with square icons. Press and hold the icon of the item you want until a copy appears under your finger. Then drag the copy over any of the HUD buttons and let go. Press the close button to resume the game. When you equip a weapon, an attack button will appear above the jump button. If the weapon can block, a block button will also appear. Attacking, regardless of whether you hit anything, costs energy. Energy starts to regenerate a few seconds after your last attack, but attacking again interrupts regeneration and restarts the clock. Successfully blocking an attack consumes focus. Focus regenerates at a constant rate and is never interrupted. Using magic also consumes focus. When an enemy blocks one of your, there is chance you'll stun it for a few seconds, leaving them vulnerable. In when dealing with larges groups of enemies – say, zombies or gnomes – you can stun them all at once with a well aimed pushed spell. Weapons can also affect multiple targets. So if you've managed to stun your enemies close together, you can hack them to death as a group. To open the pause menu, tap the status bars in upper left corner of the screen. On this tab, you can create new saves, load old ones and return the main menu. The game will save automatically from time to time to protect you from unexpected character death, but you should still create a save file of your own and update it before quitting or switching apps. Here you'll find more detailed information about all the items you've collected. Any spells you learn will be detailed here. As you go progress, log entries will be created summarizing events so far. If you get stuck or can't remember what you're supposed to be doing, reading the log should help. Here you'll find a few configurable options. Volume - This slider functions a universal volume control for all the game's sound effects. It's useful if you want to change the volume of the game without affecting the volume of your device. For example, perhaps you want to listen to music or a podcast while playing and find that the sounds effects are distractingly loud. Joystick on Right - This option move the look controls to the left and the joystick to the right. It's intended for left handers that prefer to steer the character with their dominate hand. Disable Tutorial - A tutorial normally plays when starting a new game. This option skips the tutorial for all future new games. Show Console - This option adds the console tab to the pause menu when it's next opened. The console is used for debugging and should be ignored. If you've reached a part of the game that you just can't get past, you could theoretically visit the Spoilers page. This is not recommended as it can have a negative effect one's feelings of self worth.